You and just about all the other ETF specialists are very adamant about using leveraged ETFs as short-term trades only. Please comment about what I’ve done for a 5-year period of time that I’ve outlined below. I’ve been investing in the ProShares 2X leveraged S&P 500 ETF (NYSEARCA:SSO). My calculations are from charts over the past 5 years. I use the 5 year period of time because I’m a long term investor and for longer than 5- years we have been in a very substantial positive market with but a few minor blips along the way. According to my calculations (and using the S & P 500 ETFs) if you had invested in SPDR S&P 500 ETF (NYSEARCA:SPY) (1X unleveraged) and SSO (2X leverage) the following figures are true: SPY was up 88.2% from 11/21/09 to 11/21/14. SSO was up 248.8% during the same time period…even nicer. If at any time the SMA or EMA if you prefer (simple and exponential moving averages) for these ETFs fell below a certain predetermined level of your own choosing (such as 50DMA or 200DMA) and held for 3 closing days, you’d exit the position and wait for the trendline to rise above that moving average and make sure it held for 3 days before reinvesting. This works so well that it’s scary and would almost guarantee a substantial profit over time. Do not expect great results unless you follow this technique for at least 3 years. Using the S&P 500 you have good diversification and there would be minimal trading in and out depending upon the moving average you use. Using 2X leverage gives you substantial upside potential in a bull market and going into cash or equivalents when there’s a downturn helps preserve capital and prevents catastrophic losses. Do you see any problems with this method? I’ve been using it for a long time and have gotten exceptional results particularly in this strong bull market. Using leveraged 2x (double) and 3x (triple) ETFs (NYSEARCA:SPXL) as buy-and-hold long-term investing vehicles isn’t how they were built to be used. However, that doesn’t necessarily mean you’ll have unsatisfactory results if you use them that way and you’re living proof. 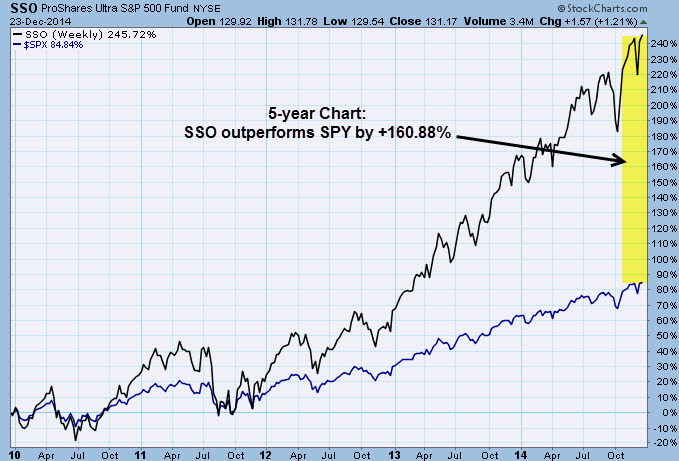 We plotted a 5-year chart of SSO vs. the S&P 500 index (SNP:^GSPC). (See below) The first observation is that SSO is a 2x daily levered S&P 500 fund and it gained 245%. Shouldn’t it have gained 172% or double the S&P 500’s five-year 86% return? The answer is no and it’s mainly because SSO is built to deliver 2x daily exposure to the S&P 500, not 2x annual or 2x multi-year exposure. For that reason, SSO’s performance over a year or many years will often deviate from the straight up 2x annual or 2x multi-year performance return of the S&P 500. Again, these performance discrepancies over longer periods are normal and should be expected. The trading system you’ve developed with SSO – so long as it stays above your SMA or EMA criteria – has worked like a charm during this particular market cycle. Congratulations! But like all trading systems, these tehniques aren’t necessarily error proof or without consequences. For example, you’ve absorbed considerable volatility – more than most people can probably tolerate. Also, you’ve encountered an extremely favorable market climate for hyper-bullish trades where just about anything 2x or 3x leveraged long equities (except for gold miners) has been a moonshot. Bear markets are particularly good at dismantling trading strategies that were previously deemed as indestructible and your neat little system is no different. Eventually, the unfortunate day will arrive when your trading strategy won’t work and you’ll need to find a new system. Financial markets are dynamic (NYSEARCA:IVV) and constantly changing. And that’s why rigid methods that don’t recognize change by adapting often fail. On a positive note, your trading strategy uses a strict buy/sell discipline. Isn’t that something more traders and investors should be doing? Thanks for the question M.K. and we hope continued success to you.